An imprint of A & C Black Publishers Ltd.
Another in the series of Wisden anthologies, this expertly edited series of writings about Yorkshire cricket by Duncan Hamilton traces the history of one of the most successful of English counties. The collection of writings, taken from Wisden down the years, covers legends of Yorkshire cricket, captains, other personalities, grounds and an understanding of the way in which Yorkshire approach their cricket. Some of the leading writers throughout the years appear within these pages including Neville Cardus, R.C. Robertson-Glasgow, Scyld Berry and Yorkshire’s own Bill Bowes has many of his articles reproduced in this fascinating book. 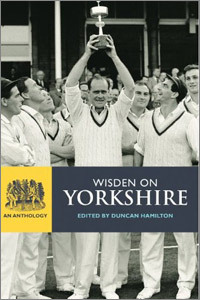 The writings include Yorkshire’s finest including Sir Leonard Hutton, Fred Trueman, Hedley Verity, Brian Close, Geoffrey Boycott, Ray Illingworth and Herbert Sutcliffe amongst others. Within these many of the profiles are the well-known stories which many of us have heard and loved. These profiles are taken usually from Wisden’s Cricketers of the Year - of which there have been forty-two - or obituaries and, in Boycott’s case, as a special article after reaching his 100th hundred. There is also a chapter on those players who have personified Yorkshire grit and epic Test matches played at Headingley are also given a good mention. Chapter ten chronicles some memorable matches not quite all of which Yorkshire won and there is a decent statistical section and index. The internal controversies are not missed and this book is a fascinating anecdotal history of one of the proudest counties with so many memorable players as seen through the eyes of some the finest cricket writers. This is a tremendous read: we know how much has been written about Yorkshire cricket and how much could be put into this book and maybe the difficulty is best summed up in Duncan Hamilton’s notes and acknowledgements when he writes that he was initially asked for 80,000 words, his first draft came in at 150,000 and eventually publishers, A & C Black, and he settled on 120,000. Readers will be pleased, I am sure, for the extra 40,000 words.